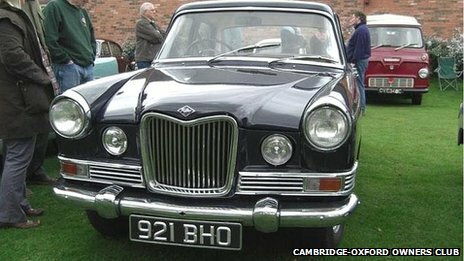 The last known surviving roadworthy Riley Riviera has returned to the city where the cars were made in the early 1960s. The navy blue model was one of a small batch of Rivieras built in Salisbury by the now defunct Wessex Motors garage. It was driven 260 miles (418km) from Burnley in Lancashire for a "one off visit" by current owner Mick Holehouse. There are no exact production figures for the car but it is thought just 15 were converted from production models. "I got it in 2004 and it was in a shocking state," said Mr Holehouse. "I got it from Basingstoke in Hampshire and trailered it back to Lancashire and then it took four years to renovate." Now thought to be the only Riley Riviera still running, the 1961 model was driven to Salisbury earlier and a number of former employees of Wessex Motors came along to see it. "We've had a eight or nine people who used to work on the cars come and look at it, which considering it was 52 years ago is great" Mr Holehouse said. "They've been reminiscing, telling jokes and sitting in the car but not driving it - it's a static display." On Sunday, the last known remaining car from Wessex Motors will be on display at the Wilton Classic and Supercar event.